Not that I got rid of my whole sock drawer -- but I did go through it. I was inspired to do my sock drawer first because the author of Stuffocation, the book that inspired me to embark on this challenge in the first place, devoted several paragraphs to discussing what he'd reduced his sock drawer to. 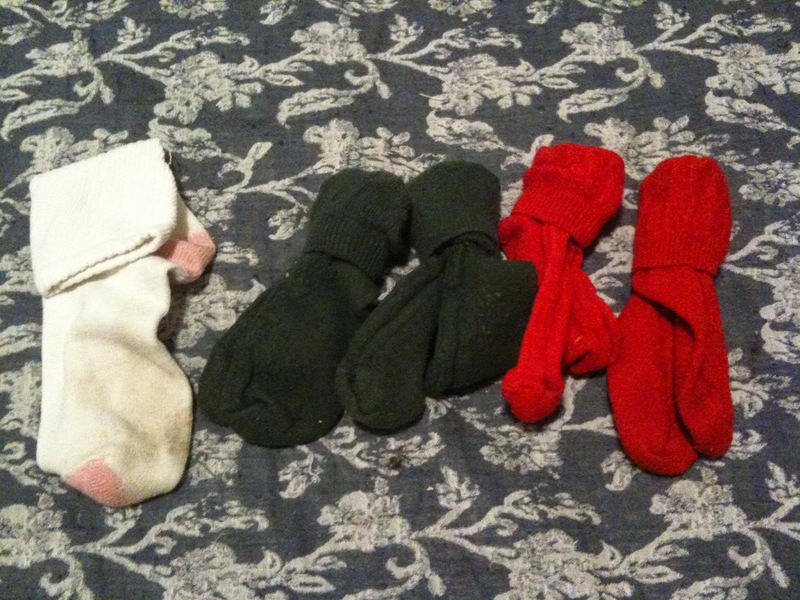 Four pairs of winter socks that I rarely ever wear because they're too tight and not really thick enough to make a difference, and a single stretched-out sock that I was keeping... just in case one of my other worn-out socks needed to be replaced, I guess. I decided that I ought to just toss all the worn-out socks and buy new ones, instead of tossing them one at a time as they develop holes, and keeping singles in my drawer. I also got rid of some unmentionables, but I decided not to kick off my blog by posting pictures of them. I don't know my readers well enough for that yet! There are still some extra pairs of shoelaces in my sock drawer and some other various things that I probably ought to have gotten rid of, but the "But I might need that!" side of me won over -- especially with the extra (and unused) pair of boot laces. Since riding boots seem to go through their laces pretty quickly, that one is actually a legitimate concern. The tennis shoe laces... Well, maybe I'll go back at some point and get rid of those too. The unmentionables and the single sock were all pretty worn out, so I just tossed them. The Christmas color socks I was thinking I might hang onto for sock puppets or some other kind of craft project with the kids I take care of next December. (Wouldn't they look cute with googly eyes and yarn hair?) I may or may not go through with it, though -- storing four pairs of socks for the next seven or eight months seems like it would complicate my life more than simplify it! If I decide not to hang on to them, though, I'll add them to the next load of clothes I take to Goodwill. I actually may not be quite done with my sock drawer yet -- I did my purge when I had a load of laundry in the dryer, so will likely be more worn-out socks following that single into the trash! I think the first few posts are going to focus a lot on groups of things, especially clothing items, as that's where I feel like I need to do the most decluttering. I also want to accumulate a load to take to Goodwill fairly quickly, so that I'm not storing my discards for a long time. This is exciting -- I can't wait to do more tomorrow!